Belford Hostel v Edinburgh, Skotsko: Zarezervujte nyní! Centrally located in Edinburgh's West End near the ancient and beautiful Dean Village and Water of Leith. 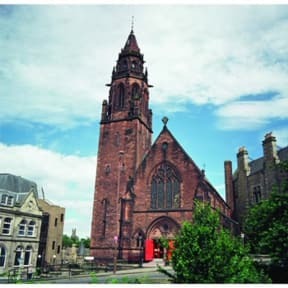 Belford Hostel is a unique and lively converted church. Our dormitory accommodation is located within the old church hall complete with stained glass windows! Dorm sizes range from 2-10. It's a great place to relax and unwind after a hard days travelling or sightseeing, and an ideal spot to meet fellow travellers. •'Non-refundable bookings' will be charged within 24 hours of the booking being made and as stated, are non-refundable! It is a fantastic place to stay in Edinburgh. Great location, quick and friendly staff, absolutely great private rooms, if you want to rest after hiking or sightseeing. I will be back for sure! Belford Hostel is wanderful place to stay. It's not far from city centre, but thanks for building there is a pleasant atmosphere to sleep. Showers and toilets are clean and I never need to wait (but I wasn't there during a weekend). There are lockers in rooms and you don't need your own lock. Have you ever slept in a church? No? Well this is your opportunity! I was so suprised when my boyfriend took me there, it was amazing! We stayed for 2 nights. Staff was very friendly and helpful, room was clean and so were the bathrooms (cleaned 3 times a day if I remember it right). Huge kitchen, bar, TV room, dining room, everything was there! It was AMAZING and if I'm coming back to Edinburgh, I'm definitely sleeping there again. Thank you so much for this amazing stay!